Please bear with me and my lack of recent production. Busy, busy, life….yes, I know, aren’t we all! Anyway, what prompted me to drag this recipe back out was the price of lettuce these days – $4 per head!! It got me thinking that maybe people stumbling on my blog might also be seeking an alternative. Here is a re-run of what I was thinking 2 years ago. I had gone to my local grocery store for solace, but as luck would have it, solace was not to be found. Cruising the strip, aka the produce department, I lamented the fact that all the lettuce is limp and the lettuce tips burned. The selection is limited; red leaf, green leaf, romaine; the constant spraying of water on these already flaccid salad greens does nothing to save the day. You would be forgiven for thinking these were the only lettuces available in the world because that is all that can be found summer and winter in your mill of the run grocery store. Browse through any seed catalogue, however, and you will find pages of lettuce varieties with enticing names: Lovelock, Red Deed Tongue, Plato, Cimmaron, Rouge d’Hiver. A far cry from the blandness of red, green and romaine. What to do about this pitiful display of salad greens? First of all, a salad does not have to be made with lettuce. 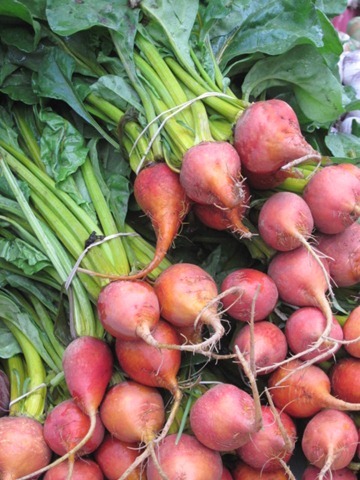 If you look to what is available locally here in the Okanagan, you will find beets, potatoes, winter squash, carrots, red and white cabbage, celeriac, onions, shallots, garlic. 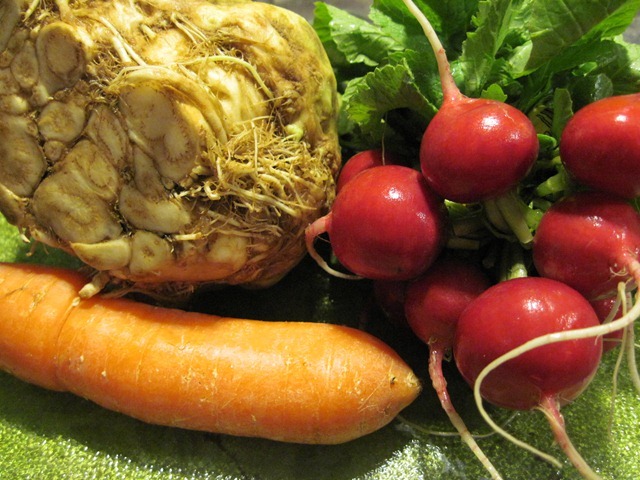 Okay, maybe these vegetables do not exactly scream “salad” to you but they are readily available and, with a little forethought, can be turned into something salad-like when the lettuce and tomatoes are too dreary, or too dear, to contemplate. 1. In a small bowl, whisk together mustard and white wine vinegar. Whisk in olive oil until dressing is creamy. Add salt and pepper to taste. 2. Peel celery root. 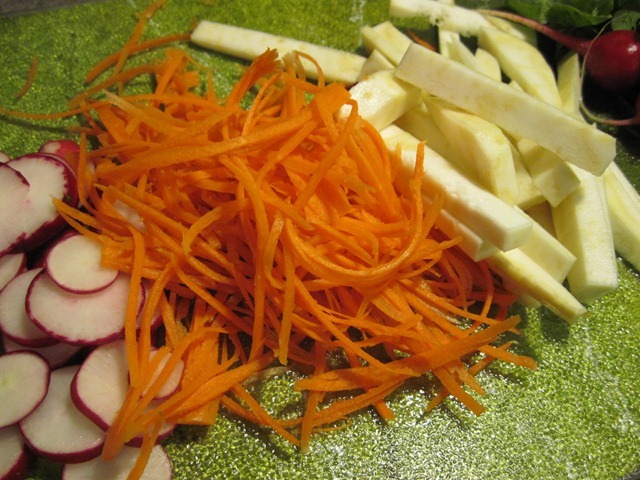 Cut root in half crosswise and slice each half into julienne strips. Put julienne strips in a bowl of cold water. 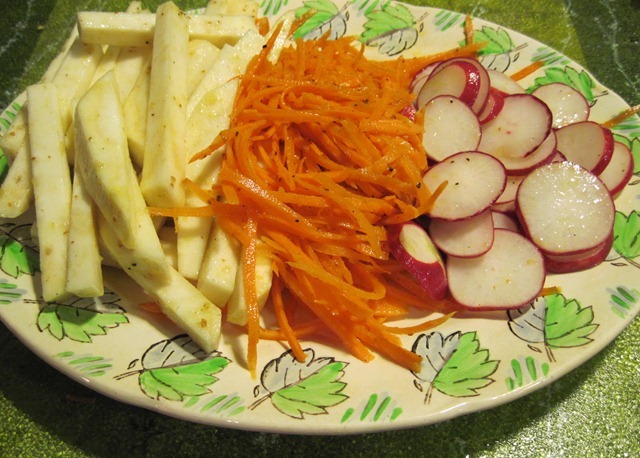 Thinly slice radishes and thinly slice carrots into matchsticks or julienne. I like long thin julienned carrots but you do what you like. 3. Drain and pat dry celery root. Place prepared vegetables into separate bowls. Add about 1 1/2 teaspoons of dressing to each bowl and toss well. Season with salt and pepper and toss again. 4. Arrange vegetables in separate piles on a platter and serve. It is that simple. Thanks for following! Next week – who knows. Come back (or subscribe) to find out!